Summertime brings hot weather, barbecues and usually a slight easing of the technological pace. It’s a great time to poke around and round up the unique developments, slipping in during lazy days, that might have a big effect on near-term or just-over-the-horizon tech. I’m a blue-sky guy and my work is frequently deemed “not practical.” Oh, well, that’s the nature of the Off-The-Shelf Hacker, taking a blank sheet and actually crafting a working prototype. Is all of the newest tech practical? A lot of times, we just don’t know yet. For example, is a $700 touchscreen, Wi-Fi, quad-core and GPS-equipped marvel of miniaturized engineering, practical? We all know it as a modern cell phone. We all have one. Is it practical? You decide. Toyota recently announced that it would be using Automotive Grade Linux (AGL) in its vehicle entertainment system. I saw a demo at the Embedded Linux Conference back in February. Much of the work was focused on the human driver interface, like the instrument cluster and heads up displays (HUDs). The big idea behind AGL is to develop a standard that OEMs (original equipment manufacturers) can use to bring third-party applications and support into their various brands of vehicles, according to Electronic Design. The demo software runs on several hardware platforms, including the Raspberry Pi, so if you want to try it out, here’s your chance. It’s interesting to think about using Linux in vehicles. Cars today have lots of built-in capabilities, like Wi-Fi connectivity, that could be hacked and augmented. How much of that will come to pass, we’ll just have to see. Why Is Alexa a Big Deal? With the Alexa assistant, Amazon has absolutely crushed the next dominant interface for buying retail items: Your voice. The company doesn’t have any other competitors, to speak of, at least not in the retail space. Yup, the pun was bad. Retailers, like Walmart, have relied on customers showing up in their stores to buy things. Amazon delivers the goods right to the customer. Fast delivery was paramount. Now with the Alexa-driven Amazon Echo and Dot, you just need to ask and your stuff will soon show up on your doorstep. Amazon has ever so quietly, set up the back-end of this physical computing stack to optimize ordering and delivery. It’s seamless and painless. We’ve covered setting up Alexa on the Raspberry Pi and using the voice service to flash lights on a CHIP computer. I don’t use my Dot for purchases, yet. I do listen to talk radio and request math conversions and such. The LinuxGizmo site alerted me to an Alexa-ready digital alarm clock radio that uses the hackable CHIP Pro. Who would have ever thought of that one, even three years ago. Practical? I’d say yes. We’ve talked about the CHIP, in past projects. The Mosquitto Under Glass MQTT Broker, uses the CHIP board. Next Thing Company, the CHIP’s parent company, recently released the CHIP Pro. It’s a production-ready single-board computer, running Linux, with a bunch of general purpose input/output pins. Both models have onboard Wi-Fi. 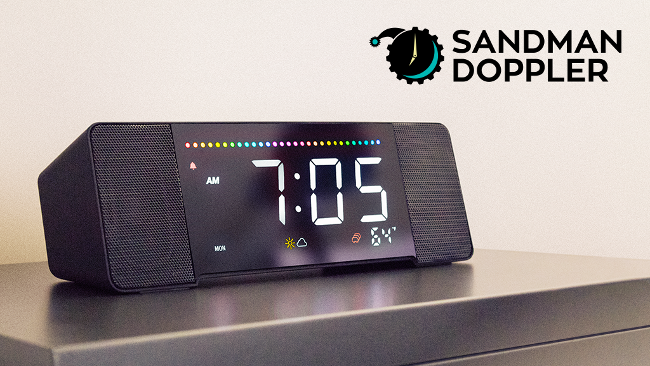 Now startup Palo Alto Innovation (PAI), has a Kickstarter going to get its second-generation Sandman alarm clock radio called the Doppler to market. Think of the Dot as a minimalist Alexa-enabled, audio gadget. It also has that cool LED ring, a small speaker and multiple microphones. The Sandman Doppler heads in exactly the opposite direction. It’s an Alexa-enabled alarm clock on steroids. There’s a big digital clock display on the front, buttons that control various functions and a color-changing LED bar. You can charge all your digital devices using the Doppler’s six USB ports. Of course, there’s also Wi-Fi and Bluetooth. PAI’s website makes a big deal about the time the company put into perfecting the sound from the speakers. To me, about the only thing missing is probably a color LCD display. Another thing that sets it apart from other “commercial” products is that it runs Linux AND you can get into the software through a “hidden” USB port. I suspect you can run your own programs, perhaps install servers and set it up for remote access using SSH. Could you use Python and some MQTT functions to track your alarm clock habits, receive commands from an Internet of Things server, perhaps using MQTT or alter the panel LEDs and digital display for interesting new effects? Off-The-Shelf Hackers will certainly recognize the possibilities with this kind of product. I’ll have to look into how the Doppler accomplishes implementing Alexa voice control on the CHIP Pro. Could be some cool projects there.